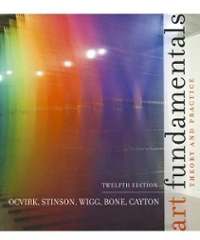 Art Fundamentals 12 Edition The original textbook that set the standard for art foundations courses across the country, Art Fundamentals has guided generations of students through both the essential elements of art and the rich and varied history of their uses. We have organized Art Fundamentals to assist with “knowing” and “feeling” the fundamental concepts of refined creation. Our intent is to stimulate without locking students into a restricted mind-set or mechanical copying of ideas.